I love this soup. It’s a great winter warmer. 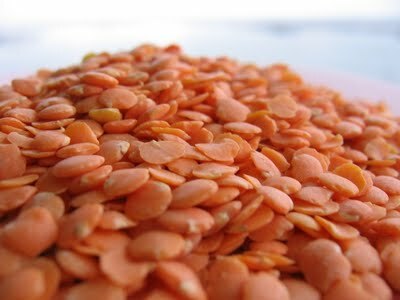 Red lentils have a very high protein content and are fast cooking (Serves 6). In a large soup pot cook the onion in olive oil until soft. Add all the spices and the garlic. Cook for a few more minutes. Pause for a second, savouring the intoxicating fragrance emanating from the pot and then pour yourself a glass of wine or beer. Next, add the tomatoes and simmer for about 5 minutes until the sauce has reduced slightly. Add the lentils, carrots and the stock. Simmer, partially covered for about 20 minutes, stirring occasionally. You may need to add some more water if it gets too thick. When the lentils are cooked add the lemon juice and parsley. Simmer uncovered for a further 5 minutes. Serve with a little fresh parsley and some plain yoghurt.